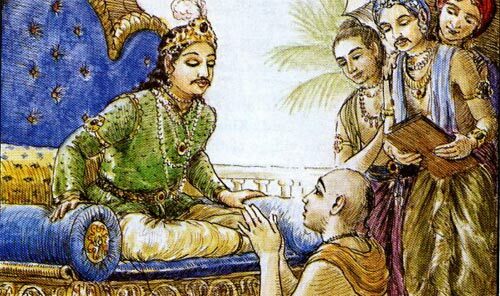 King Indradyumna was a great devotee of Lord Vishnu and was very eager to meet Him face to face. One time, by the Lord’s arrangement, a devotee of the Lord arrived in the court of King Indradyumna, and in the course of discussion he began to talk about an incarnation of Lord Vishnu named Nila- madhava. After hearing these topics, King Indradyumna became very inspired and sent different brahmanas in different directions to search for and inquire about Lord Nila- madhava. All of them, however, were unsuccessful and returned to the capital city of the King, except for one priest of the name Vidyapati. After wandering in many places, Vidyapati finally came to a district whose population was of a non-Aryan type called Sabara. There he took shelter in the house of a local of the name Vishvasu. When he arrived, the master of the house was not there, but his young daughter, Lalita, was there alone. In a short time the master of the house returned and instructed his daughter to render all service needed for hospitality to the brahmana guest. For some time Vidyapati stayed there, and later, by the special request of the Sabara, he married the Sabara’s young daughter. After that day, Vidyapati’s joy knew no bounds. Actually Lalita had been ordered by her father not to tell anyone about Sri Nila-madhava, but she overstepped that order by telling her husband. Vidyapati immediately became eager to see Sri Nila-madhava, and finally one day, by the repeated request of his daughter, the Sabara Vishvasu bound the eyes of Vidyapati and took him to see Sri Nila-madhava. As they were leaving, Vidyapati’s wife. secretly bound some mustard seeds in the border of Vidyapati’s cloth, and so while passing on the path he threw them down to mark the way. When they reached Sri Nila-madhava the Sabara removed the blindfold, and Vidyapati, seeing the unprecedented beauty of the Deity of Sri Nila?madhava, began to dance in ecstasy and offer prayers. As he was about to jump, however, a voice in the sky said, “O brahmana,since you have been able to see Sri Nila-madhava, you should before all else inform King Indradyumna.” Thus the brahmana climbed down from the tree and waited. To build the temple, King Indradyumna made arrangements to bring stone from a place called Baulamala by building a road from there to the Nila-Kandara Hill. The holy abode of Sri Kshetra, or Puri, is in the shape of a conch, and in the navel of that conch the King established a town of the name Rama- Krishna-pura and constructed the temple. The temple extended 60 cubits beneath the earth and rose 120 cubits above the surface. At the top of the temple the King built a kalasa,or round pinnacle, and on top of that a cakra,or disc. He also had the temple decorated with golden ornamentation. Then King Indradyumna, desiring for Lord Brahma to consecrate the temple, traveled to Brahmaloka and spent a long time there waiting for him. During that time, the temple, which is very near the sea, became covered with sand from the shore. When King Indradyumna was away, first Suradeva and then Galamadhava took over as the kings of that area. it was Galamadhava who raised the temple from within the sands, where it had been buried for a long time. Shortly after the temple was uncovered, however, King Indradyumna returned from Lord Brahma’s abode. Indradyumna claimed that he had constructed the temple, but Galamadhava put forward the claim that he was its constructor. In a banyan tree near the temple, however, lived a bhushandi crow who had been living through many ages, constantly singing the name of Lord Rama. From his abode on the branches of that banyan tree, the crow had seen the whole construction of the temple. Therefore he made it known that actually King Indradyumna had constructed the temple and that in his absence it had been covered by sand. He further said that King Galamadhava had later merely uncovered the temple. Because King Galamadhava had concealed the truth, Lord Brahma then ordered him to reside outside the grounds of the temple, on the western side of the lake called Indradyumna-sarovara. The King began to work according to the instruction of that dream. He brought the Sabara Vishvasu and put him on one side of Daru-brahman, and on the other side he put the brahmana Vidyapati. Placing a golden chariot before the Daru-brahman, he then started kirtana, chanting of the holy names of the Supreme Lord. Then the King caught hold of Daru-brahman and prayed for the Lord to mount the chariot. Daru-brahman was then easily placed on the chariot and taken to an appointed place. There Lord Brahma began a sacrifice and established a Deity of Lord Nrisimhadeva on the raised platform of the sacrifice. It is said that the place where the present temple stands is the place where the sacrifice was performed and that the Nrisimha Deity now standing at the western side of the Mukti-mandapa in the temple compound is that original Nrisimha Deity. To carve the Deity of Lord Jagannatha from the Daru- brahman, King Indradyumna called many expert sculptors. None of them, however, was able to touch Daru-brahman, for as soon as they started, their chisels broke and fell to pieces. Finally the Supreme Lord Himself came in the disguise of an old artist who introduced himself as Ananta Maharana. * [According to the Narada Purana (Utkala Khanda 54.22-65), the artist Vishvakarma, the architect of the demigods, carved the Deities in pursuance of the desire of Lord Vishnu, who had assumed the form of an old brahmana.] He promised that if he were allowed to work behind closed doors for twenty-one days, the Deity would be carved. Immediately preparations were made. According to the old sculptor’s directions, all the other artists were engaged in making three chariots. The old sculptor then took Daru-brahman into the temple and closed the doors, after making the King promise that the sculptor would reside alone and the King would not open the doors of the temple even slightly before the twenty- one days were up. After fourteen days had passed, however, the King was unable to hear the sounds of the artist’s tools, and so he became full of anxiety. Although his minister again and again forbade him, the King, on the advice of his queen, by force opened the door of the temple with his own hand. “Without legs and hands, He moves and accepts. Without eyes He sees, and without ears He hears. He knows all that is knowable, but no one knows Him. They call Him the original Supreme Person.” To protect this assertion of the Vedas,Lord Jagannatha takes His form without hands and legs. Still, Lord Jagannatha is able to accept fifty- six different types of food, offered eight times daily, and He tours the world in His splendid carts. The Supreme Lord Narayana tells Lakshmi-devi, “In that great abode known as Purushottama-kshetra, which is rarely achieved among all the three worlds, the Keshava Deity, who was fashioned by the Supreme Lord Himself, is situated. If men simply see that Deity, they are easily able to come to My abode.” In this way Lord Jagannatha is delivering the whole universe, especially as He rides on His cart before the eyes of all. Therefore I offer my prostrated obeisances to Lord Jagannatha, Subhadra and Balarama on the occasion of Their chariot ride and pray for Them to forgive me for any offenses I have committed in my clumsy attempt to describe Their glorious appearance.